Design of output protocols is defined in the right side of the template dialog window. It is possible to define arbitrary amount of output protocols for each template - also for one type of field test. In the upper part of window we define general look of output - there we select if the protocol is used for "Field test" or "Soil profiles" and also we define scale of protocol (one or two pages, 1:50, 1:100). We select an edited part of protocol by using tabs. Editing of cell/field is similar to working e.g. in MS Excel - use a double click on field. The field can contain data from various sources - as you can see on the picture. it is possible to select from predefined strings - item "Global multilanguage text"
it is possible to select from predefined pictures - item "Picture - name"
or write an arbitrary own text into the field. It is important to distinguish between items "Name" and "Data". "Name" inserts name of data type (e.g. Drilling foreman), "Data" inserts entered information (e.g. Mr. Smith). Output regarding soil layers data has a different form - it is edited in columns. 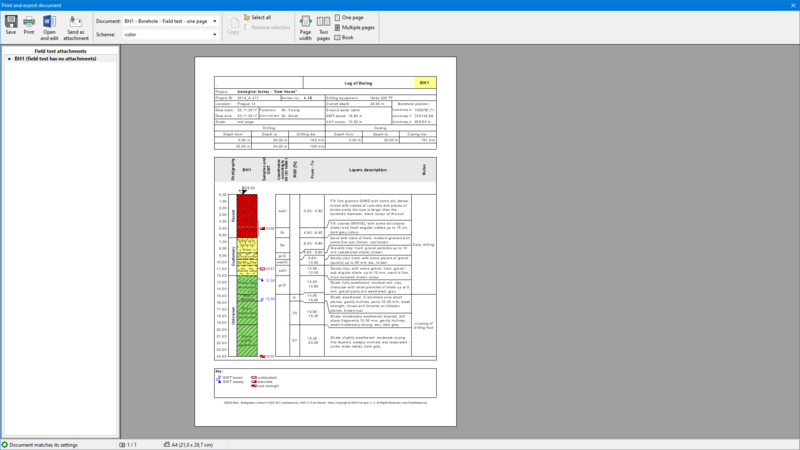 After editing protocol we can check a final created template in the "Field Tests" or "Soil Profiles" frames - after selection of field test and pressing "Print log" button, the view of print is displayed.